Following up on my recent installation of the Atlassian product suite at home, I had a really positive experience setting up Bamboo to work with several of my recent Grails projects. Bamboo has proven to be a powerful and essential tool at my day job and I’ve really been looking forward to putting it to work for my personal projects. I’ve also been using Git for a repository lately, and while I have nothing but praise for my good friend svn, I have to say the ability to set up a new repository in 2 seconds flat is pretty damn convenient. Since neither Grails nor Git are by default supported by Bamboo, I grabbed a couple of plugins to enable my home continuous integration system. Bamboo has a very sensible plugin model that allows for adding new capabilites with only a jar file in the right place and a server restart, and a fairly rich library of plugins. 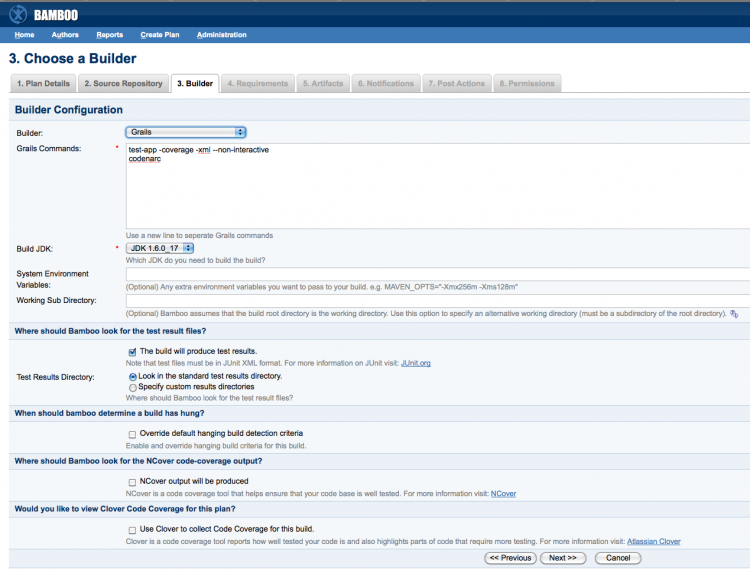 It’s also encouraging to see a company that is committed to eating their own dog food – recently they’ve moved their plugin resources to Jira studio as you can see on the Grails plugin home page. This gives you as the consumer of the software access to the wiki’d documentation, any open issues, and even visibility into when source code changes are committed. I’m assuming that last is subject to whether or not the plugin source code is open source or not, but still – pretty nifty. The Grails plugin instructions speak for themselves in the 3 screen-shots on the one and only wiki page. Anything else you need to know is summarized in a one liner on the “Builder” tab when you select the Grails builder: “Use a new line to seperate Grails commands.” Gotta love clear, simple instructions. 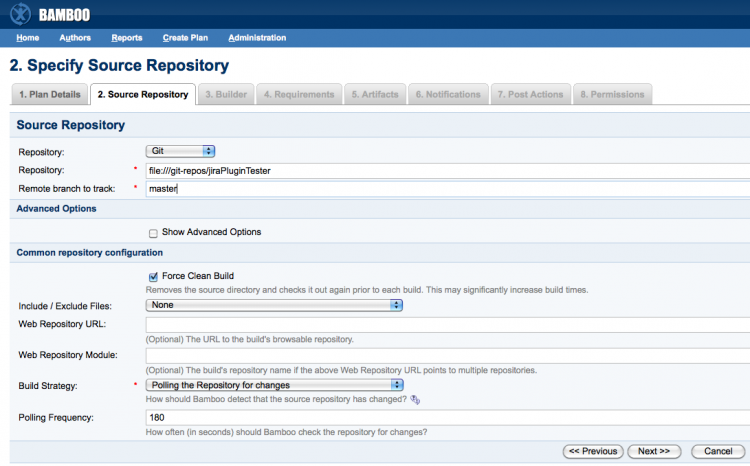 Drop the plugin jar into $BAMBOO_INSTALL_DIR/webapp/WEB-INF/lib, restart Bamboo and configure a new builder for Grails. Took a couple of minutes and knowing where my Grails install was located. A quick Google for “Bamboo git plugin” led to a bit of a hypertext chase that eventually ended up here. Looks like this particular plugin has passed through the hands of at least a couple of maintainers, but so far it’s worked exactly as advertised. And again, loving the dog food analogy, it’s nice to see a project enabling Git hosted on github. Thanks very much to Kristian Rosenvold for running with the ball on this one! Again, drop the jar into $BAMBOO_INSTALL_DIR/webapp/WEB-INF/lib and restart Bamboo. 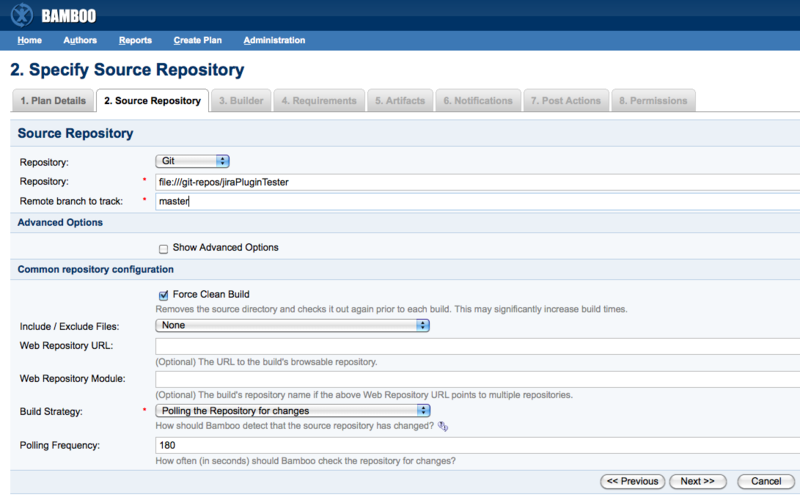 When creating a plan you will now have Git as a choice for a Source Repository. In my case I’m just using a plain file repository that resides on the build box, but it should work just as well with a remote repository. Setting up the Grails targets is similarly straightforward. Thanks to this article, which describes the Grails setup on Hudson, and reminded me about the –non-interactive flag since obviously the build server isn’t going to be able to interact with the console. I’m also using a couple of Grails plugins to provide static source code analysis so my parameters also include -coverage and a call to the codenarc script. I had a little trepidation about how this would all turn out after reading this blog post, but I’ve had much better results so far in my personal experience. It’s entirely possible that the key differentiator is wrapping Grails with Maven. It’s definitely not perfect, but it is getting better all the time. Hopefully you have better luck in the future Neil! Thanks for the shirt Atlassian! Having several projects in Bamboo that share a repository, build script and libraries, it can be tricky to configure Bamboo build plans correctly; but it isn’t hard at all. Here’s a quick walkthrough…….